This picture shows entrants in this year's FIRST (For Inspiration and Recognition of Science and Technology) Breakaway match. 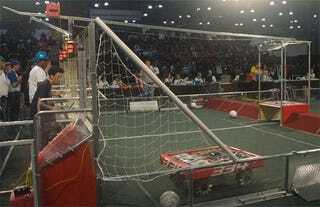 Teams of ambitious high school kids build robots to compete in what's basically the American Gladiator version of soccer. It's pretty amazing.